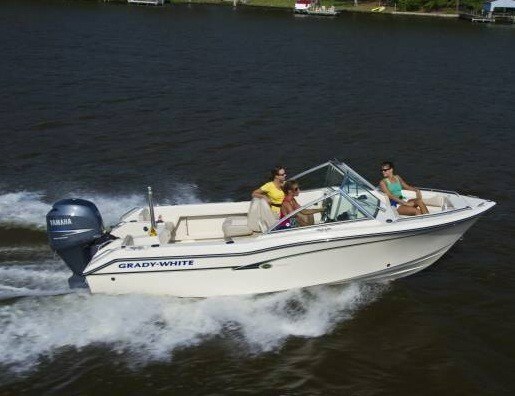 For the 2012 model year, this Greenville, North Carolina builder offers twenty-six models of Center Consoles, Dual Consoles, Express Cabin, and Walkaround Cabin boats from eighteen to thirty-six feet. 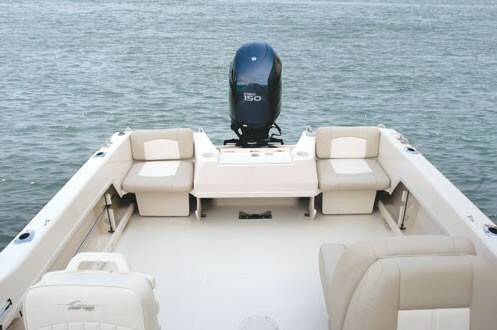 The Freedom 192 Dual Console is the smallest of eight models in the Dual Console series ranging up to thirty-four feet. "For the model year 2012, we're emphasizing our incredibly versatile Freedom Series, dual console models that bring a new level of 'freedom' to the range of activities you can enjoy. Our Freedom Series, like all Grady-White boats, are great riding, safe, sure and saltwater tough, yet filled with features to do so many things well," states Eddie Smith, Jr. and Kris Carroll, Chairman, CEO and President respectively of Grady-White. 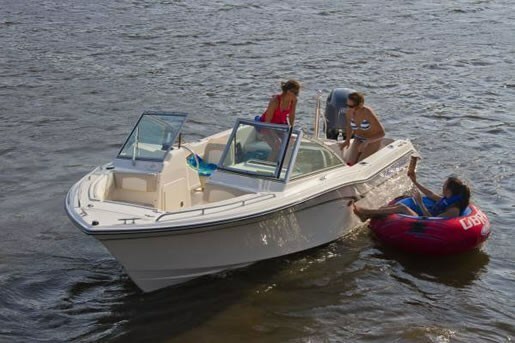 The Freedom 192 Dual Console is indeed a versatile boat – great for cruising, all forms of watersports, fishing, or for use as a cottage "hauler," being a deep and dry boat and with a relatively shallower draft and greater cockpit room given the standard outboard pre-rigging. Think of it simply as a "bowrider" in most other builder's terms with a fixed walk-thru windshield to bow seating and storage areas. But it is truly more than a normal bowrider. In its own words, "Grady-White's exclusive C. Raymond Hunt Associates-designed SeaV2 hull's continuously variable vee is truly incomparable." Built on this hull, the Freedom 192 has a full non-skid fibreglass inner liner with built-in level flotation and a self-draining cockpit which allows you to simply "hose it down" from bow to stern for quick and easy clean-up. Up front right at the bow is a huge hatch for easy access to the anchor locker providing lots of room out of the way for the anchor and all of its rode with room to spare. Longitudinal seating is provided on both sides of the bow area with bolster backrest padding not only along the sides, but also on the front of both consoles to allow stretched-out lounging. Two drinkholders are located within the handy moulded-in step, itself providing easy access up and over the bow. Dry storage is located beneath the port side forward seat cushion and a huge self-draining, 44-quart insulated cooler fills the area beneath the starboard side seat cushion. 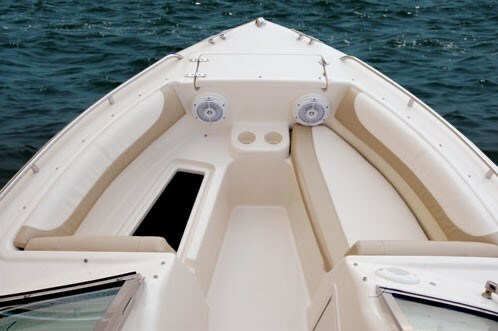 A pair of standard jump seats provides stern seating on each side of the outboard motor well. 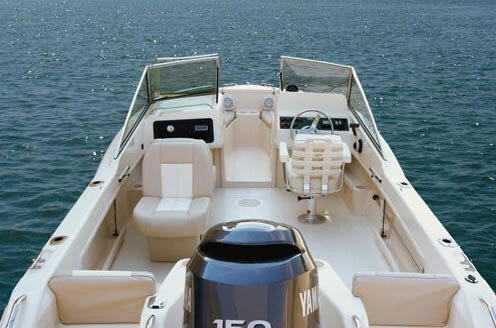 Aside from these two seats, several helm and passenger seating options can be selected to personalize the Freedom 192 to your boating requirements. Standard are helm and passenger pedestal chairs. Option one or both of these up to Deluxe helm chairs. Either of these chairs can be optionally replaced with sleeper-type fold-down seats with storage under to provide not only additional seating, but lounges as well. The helm is very clean with a custom stainless steel wheel and the normal complement of switches. Above this area is a full-width nearly vertical fibreglass surface onto which you get to choose whatever outboard engine instrumentation and/or navigation and/or fishing electronics you want. A storage compartment is provided within the helm with an access door within the walk-thru companionway. A starboard side windshield wiper is standard. The almost matching companion console contains a lockable glovebox plus a huge lockable storage area within with access again provided from the walk-thru companionway. If fishing is your thing, Grady-White provides four standard rod holders and four horizontal rod storage racks below the gunwales. A standard swim platform with ladder provides easy water access at the port side transom. There are many factory options available to further personalize this versatile runabout. 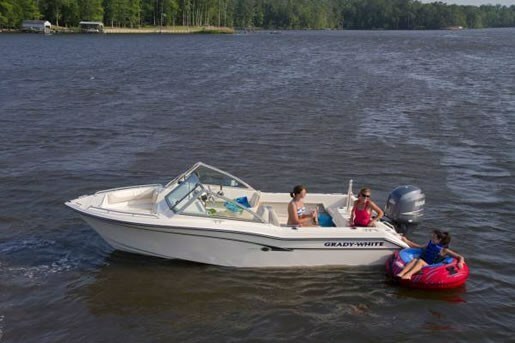 If cruising is your thing, choose ivory or navy canvas to partially or fully cover separate areas or the complete boat. 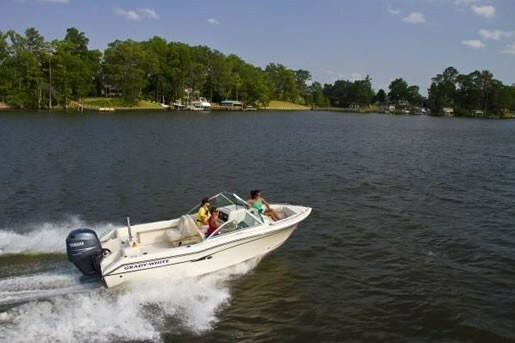 You may also want to choose the cockpit freshwater shower, the on-board freshwater tank, the satellite-ready stereo system with four speakers, MP3 connectivity, etc., hydraulic steering, and trim tabs. For fishing, you may want to add the 13-gallon insulated raw water livewell with cushion top or perhaps the pressurized raw water washdown with hose. For watersport enthusiasts, add the ski pylon and perhaps the painted hull. To sum up in Grady-White's words, "This year, Grady-White celebrates well over 50 years of private ownership and well over 40 years of continuous ownership by the Smith family. That level of continuity is almost unheard-of, and is an important factor in being able to deliver a more satisfying boating experience."